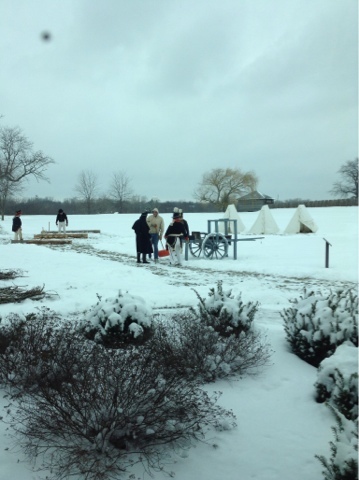 The Fort Meigs Founder's Day event was a great success. At first a morning snowfall made it look like attendance would be sparse, but to the contrary people seemed happy to beat the February cabin fever. 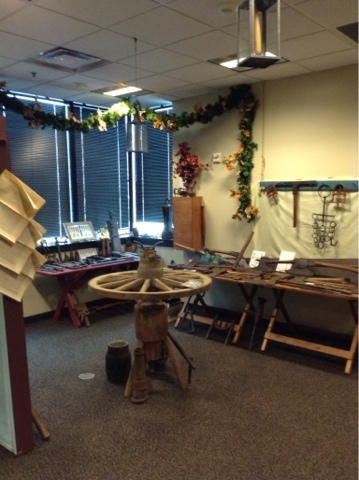 We had some new artifacts to place in the exhibits at the museum. 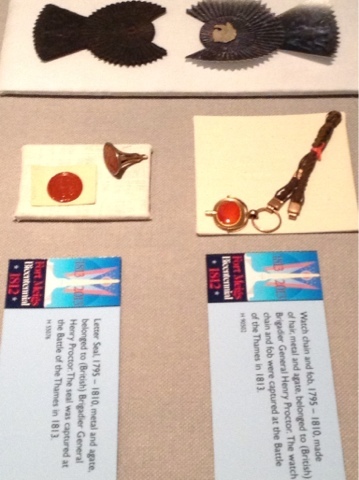 These are the watch fob-seal and winding key that belonged to British leader Major General Henry Procter. 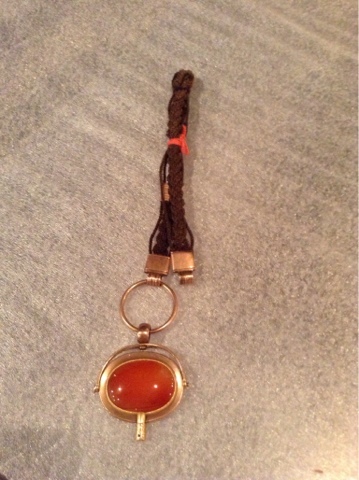 The winding key and seal hung from two braided hair cords (horse hair? human...?) that attached to the watch itself, which would have been kept in a waistband pocket of the general's trousers. 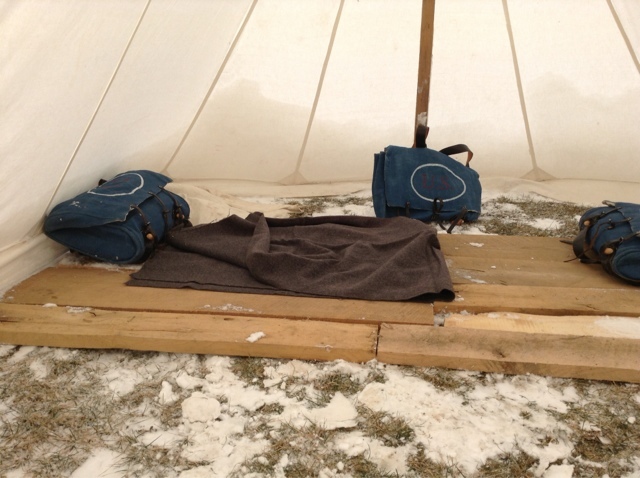 We put up several common tents, canvas wedge tents that were shared by messes of seven men each. From diaries we know that the ground was muddy, and the men would sleep on puncheons, a semi finished plank with bark on one side. Each man was issued only a thin wool blanket. Eventually some units built huts and if a mess was lucky they could scare up a buffalo hide to keep warm. If they weren't lucky, they out-marched the baggage wagons and rolled up in their blankets under the open sky. Our demonstration area outside the west gate of the fort. 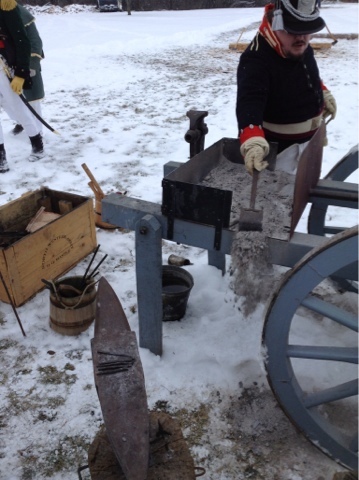 We had logs to hew, a mobile forge, and musket demonstrations near the tents. Many of the original tools were left behind when the army moved on. These are artifacts excavated on site. 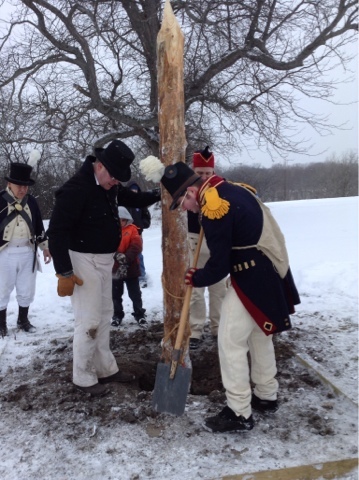 We used some reproduction tools to dig a shallow hole in the frozen ground, and put up a single picket which we had dressed with axes. Even the ropes used to move the log were made on-site using a small rope-walk. Cleaning up the forge-cart after an afternoons' work. 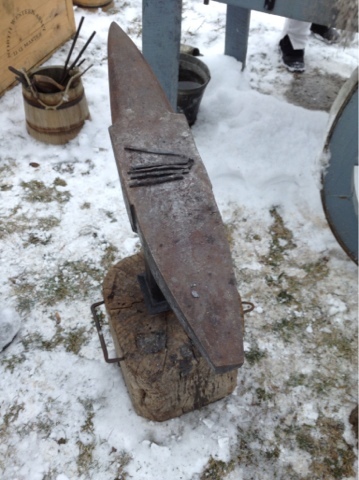 Nails made on the forge using traditional tools. 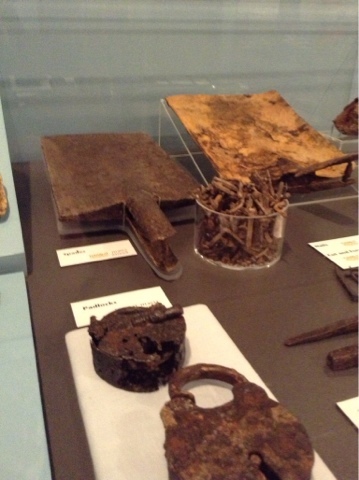 Iron was expensive and nails were labor- and energy-intensive to produce. Whenever possible on the frontier, structures were erected without using them.It truly reflects the phrase "For the want of a nail..."
An extensive private collection of 19th century hand tools was on display. One of them had the owner's name and the date "1812" engraved on it.